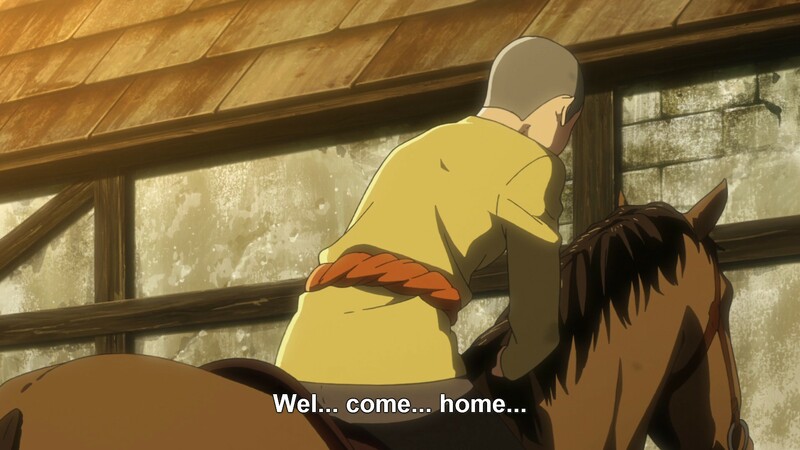 Spoiler Warning: This post contains spoilers for Attack on Titan through episode 3 of season 2. 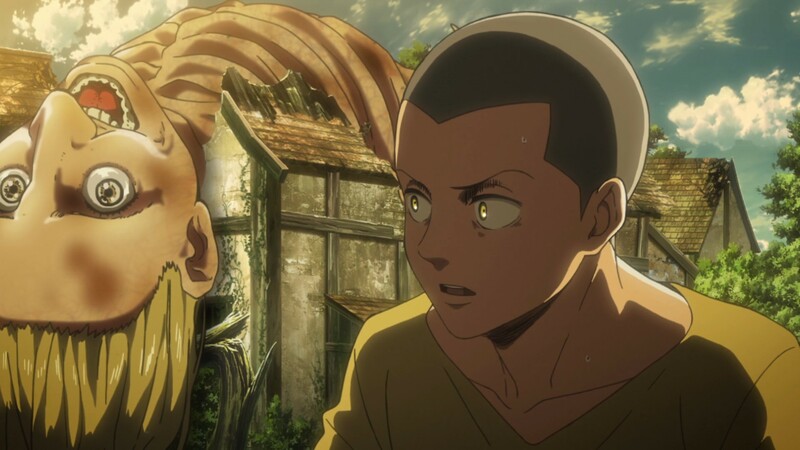 Much of the discussion surrounding Attack on Titan has focused on the action and the plot twists, for good reason too. AoT’s fights are fantastic, combining a heavy intensity with excellent choreography and CGI, and the plot is wildly unpredictable without ever going off the rails. What hasn’t been discussed as much is its skill with horror. 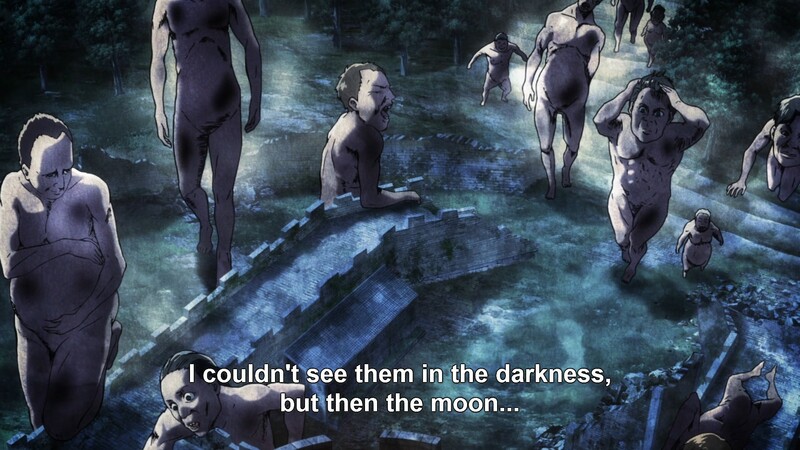 Attack on Titan always has a palpable sense of dread, but its moments of straight up horror are even heavier. The best example of this fear, which also prompted me to write this, comes from the third episode of season 2 when the soldiers were searching for the hole in Wall Rose at night. Nothing actually happened there, but that made it even worse. The soldiers (and by extension the audience) were left searching for a hole they had no idea where to find while it was so dark they couldn’t see beyond their torches. The had no idea if there were any Titans nearby and were stuck wondering how long it would be until they were killed. Nothing actually happens-they just meet up with another group of soldiers-but nothing needs to for this scene to work. The fear of the unknown is far worse than anything tangible. You can fight a monster that’s in front of you, but you can’t fight a monster that you only imagine is there. The way the scene was directed, with completely black backgrounds and no sound except the soldier’s thoughts, perfectly emphasized how isolated and helpless they were. 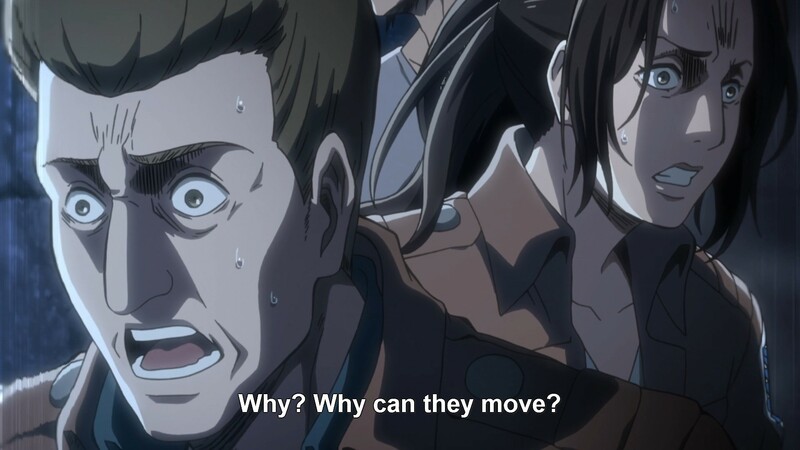 It’s this feeling of helplessness that makes the monsters of Attack on Titan truly scary. Even in a direct fight, most people who aren’t named Mikasa or Levi don’t stand much of a chance against Titans. Trained soldiers have a slight advantage over ordinary people, but, as season 1 made painfully clear, even they can die in an instant if something goes wrong. Their strength is part of what makes the Titans so intimidating, although that’s far from their scariest aspect. What makes the Titans truly scary is how little anyone knows about them. Season 1 gives a basic rundown in the first few episodes, but that raises more questions than answers. They suddenly appeared one day and started eating humans. Nobody knows where they come from, why they do it, or why they can only be killed by hitting the back of the neck. Very little is actually known for sure about them and what information there is often proves unreliable. Titans can’t move at night…until they can. Titan’s don’t talk…until they do. Even random Titans will suddenly start acting differently without anyone knowing why. Characters just call them Abnormals and try to handle them as best they can. Like I said before, what you don’t know is always scarier than what you do. Things you understand can be planned for and predicted; a monster that operates based on rules you don’t even understand is a truly terrifying opponent. Knowledge is power, and facing a dangerous enemy like the Titans without really knowing anything about them is the essence of powerlessness. That’s what makes Attack on Titan truly scary. Given the Titans are such a large enemy, I’m constantly surprised at how scary they are. Normally big monsters end up fairly comical and pretty lame, but the Titans manage on a number of occasions to be a genuinely terrifying foe. The issue is that it isn’t consistent in delivery psychological horror, as the show also attempts to pack over the top gore and action into the mix which means while there are these horrific moments and ideas, sometimes that isn’t the feeling you are left with after watching. This was a great short read. You bring up valid point of the cadets or noone knowing anything about them, that’s what scares me about them right now. Specially the parts where they’re about to have a meal just makes me feel so creeped out.